(Nanowerk News) Carbon monoxide (CO) plays an important role in cell functions, by signalling responses that counteract inflammation, and cell growth and death. As a result, researchers have been in pursuit of molecules that release CO into cells in order to study biological responses. Now Takafumi Ueno and colleagues in Japan report in the Journal of the American Chemistry Society ("Intracellular CO Release from Composite of Ferritin and Ruthenium Carbonyl Complexes") how they have developed a protein cage that overcomes the limitations of previously reported CO releasing molecules. The CO-releasing molecules developed so far, such as ruthenium organometallic complexes, have been difficult to work with because they degrade quickly and are not readily taken up by cells. Protein cages have attracted interest for drug delivery for some time, since they can retain the activity and stability of materials encapsulated in them. Recent reports have also demonstrated the ability to reduce the cytotoxicity and increase the uptake of metal nanoparticles by encapsulating them in a cage of ferritin, an iron-storage protein. “Therefore we chose to investigate whether ferritin can be used as an intracellular CO release molecule delivery carrier,” explain Ueno and his team in their report. Protein engineered ferritin cages provide capsules for carbon monoxide releasing molecules that allow slow release for enhanced activation of nuclear factors inside the cells, according to research at Tokyo Institute of Technology and Nagoya University. 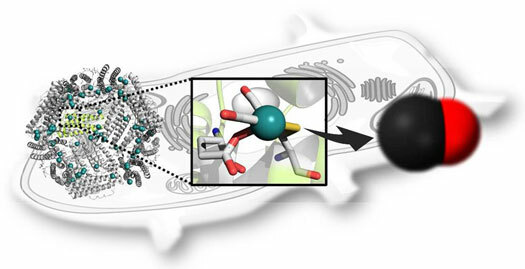 The researchers used crystal structure analysis and confocal imaging to study the structure ruthenium carbonyl complexes encapsulated in the ferritin cage, as well as the uptake by cells. The researchers successfully developed a ferritin encapsulating ruthenium-carbonyl complexes that increased the uptake of CO releasing molecules and the amount of CO released inside the cell. Their composite also allowed slow CO release, which is important for activating processes inside cells. Carbon monoxide is known to activate the nuclear factor κB in the presence of a certain tumour necrosis (cell injuring) factor. The researchers studied assays of mammalian cells incubated with the ferritin encapsulated ruthenium-carbonyl complexes. Optimising the composite yielded a tenfold increase in activation of nuclear factor κB and highlighted the benefits of slow CO release. Structures forming a cage from several weakly bonded protein subunits have attracted interest for encapsulating metal complexes and nanoparticles with catalytic, magnetic and photonic functions for biomedical applications. They have also been used for drug delivery. The ability to deliver iron oxide nanoparticles into living cells using ferritin cages has already been demonstrated. Ferritin also readily undergoes cell surface endocytosis, a process by which cells recognize absorb molecules, and reduces the cytotoxicity of encapsulated particles. The intracellular signalling functions of carbon monoxide produce important cytotoxic effects against inflammation, proliferation (cell growth) and apoptosis (cell death). The mechanism for the release of CO from ruthenium-carbonyl complexes inside molecules is understood as a ‘ligand exchange’. The bonds in the complex take the form of ligands, molecules that bind through the donation of electron pairs. Other electron-donating molecules inside the cell can exchange with the ligand releasing the carbon monoxide. The encapsulating ferritin cage can affect the ligand accessibility of these ligands, which in turn can affect the release of CO from the complex into cell. The CO releasing molecule ferritin complexes devised by the authors released CO with a half-life 18 times slower than that in previous studies. In addition, previous reported ruthenium-carbonyl complexes did not show the concentration-dependence activation for nuclear factor κB. The researchers conclude from this that slow release is more crucial for activation by CO than the uptake ratio of CO releasing molecules by cells.